Keratoconus is an eye disease that causes a progressive thinning of the cornea – the transparent front layer of the eye. It can be inherited from family members and also associated with conditions such as hayfever and excessive eye rubbing. The thinning of the cornea can create an irregular surface which is difficult to see through. Keratoconus can cause blurry vision in the affected eye(s), and in moderate or severe forms this blurry vision may remain despite wearing glasses. 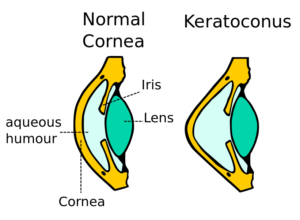 The irregular surface of the cornea can cause ghosting of images and haloes to appear in glare conditions; especially at night time. Sometimes keratoconic patients will suffer from excessive eye rubbing; the physical trauma can cause the condition. This may need to be managed with a combination of medicated eye drops, lubricants and cold compresses. In mild forms of keratoconus, blurry vision may be fully corrected with glasses. Anti-reflective coatings may be recommended to reduce the effect of glare. In mild forms of keratoconus, soft contact lenses may be a good option for correcting vision as well. In moderate forms of keratoconus, soft contact lenses and glasses may not be adequate to correct vision. In this case we may conduct a hard contact lens fitting with a lens such as the Rose K2. 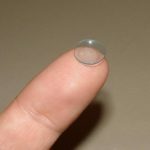 These lenses can provide a stable, regular optical surface for the patient to see through. In moderate to severe forms of keratoconus and for active patients, larger semiscleral RGP lenses such as the Rose K2XL may be more suitable due to their superior comfort and stability. Due to their larger size they tend not to fall out even during sports activities such as surfing. These lenses are more complicated to fit and require more care and handling than smaller RGP’s. Patients who suffer from keratoconus may sometimes be referred to an eye specialist for consideration of collagen crosslinking. This procedure can reduce the progression of keratoconus in eligible candidates – our optometrist can advise you on the suitability of this procedure. 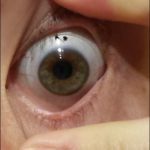 In very severe forms of keratoconus, even hard contact lenses may not be enough to achieve good vision. Therefore a corneal graft can provide a more regular surface to start over with. If you suspect you or your family member may be suffering from keratoconus, book in for a comprehensive eye examination with our optometrist, Yang Wang.